Home > Memorials > Memorial Garden Benches > Memorial Bench - Those We Have Held.. Even the briefest moments spent in a garden can cause one to reflect and treasure the memory of a loved one. 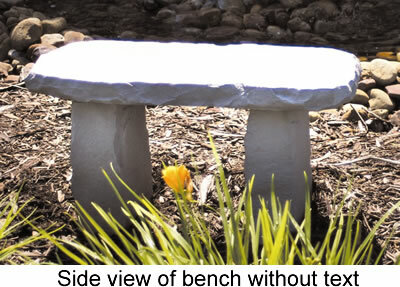 Made of cast stone, this bench is weatherproof and has year-round durability. Sturdy support legs and weatherproof adhesive are included. Made in USA. Engraving: Those we have held in or arms for a little while, we hold in our hearts forever. Personalized Memorial Bench - When Tomorrow Starts..